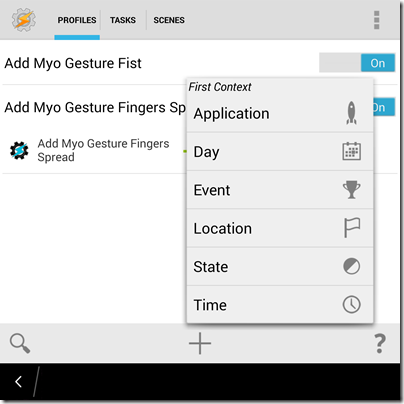 Have you ever wished you could remotely control your BlackBerry 10 phone? 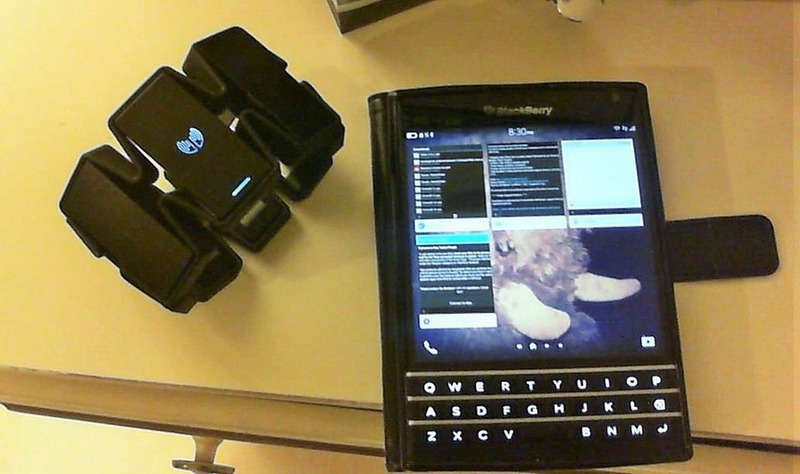 At times, this can certainly come in handy, and after starting my new career in 3D software development and touch-less interaction, I couldn’t resist seeing what this could do with my brand new BlackBerry Passport. Caution: Your mileage will vary. This is not a stable or official solution at this time but it does work. In the meantime I’m looking at building a Cascades or Unity solution! To use the event, do the thumb to pinky to unlock (it will vibrate) and then do a fist to play the song! And thats it. Myo is a Bluetooth LE arm-band designed for Android, iOS and Mac and PC from Thalmic. 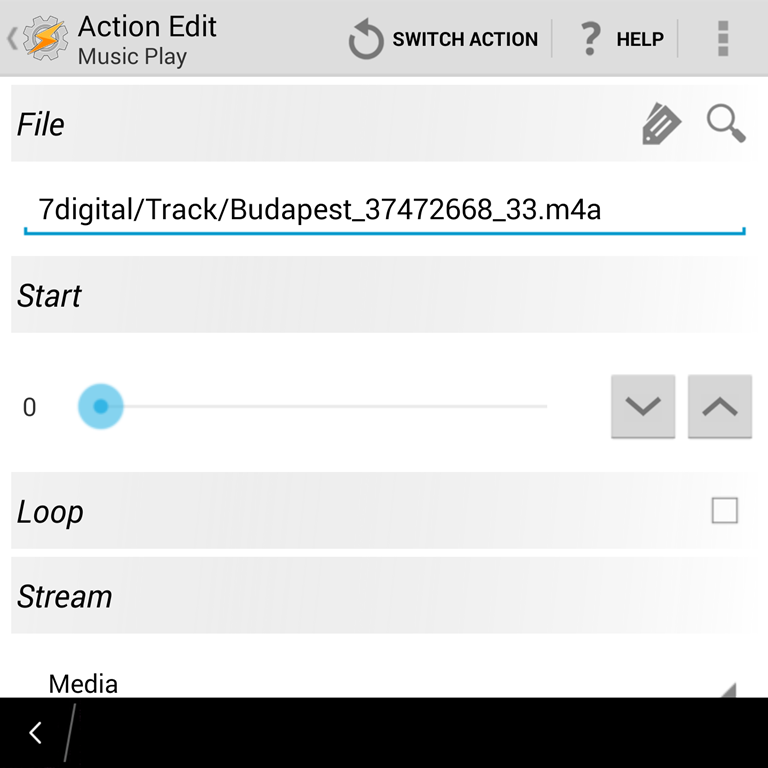 I recently picked one of these devices up and found it was extremely easy to get going on my BlackBerry device but and I thought it would be nice to share for other folks looking to get started. 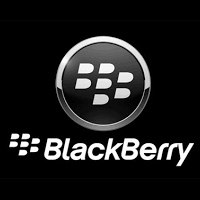 What BlackBerry Devices are Supported? Technically, none as of yet. 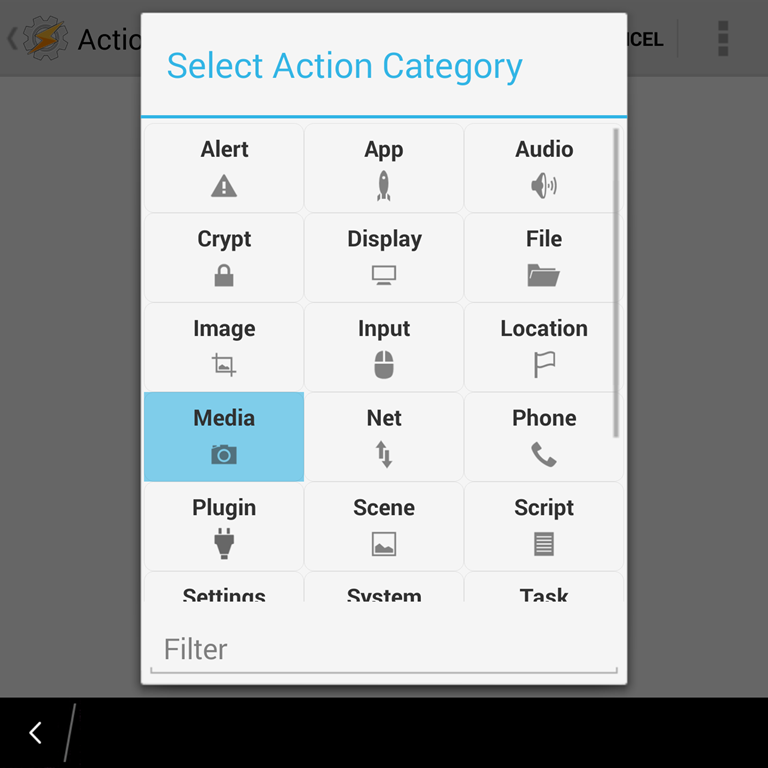 But we do run the full Android suite as of 10.2.1, meaning you can run Android applications at the native level. 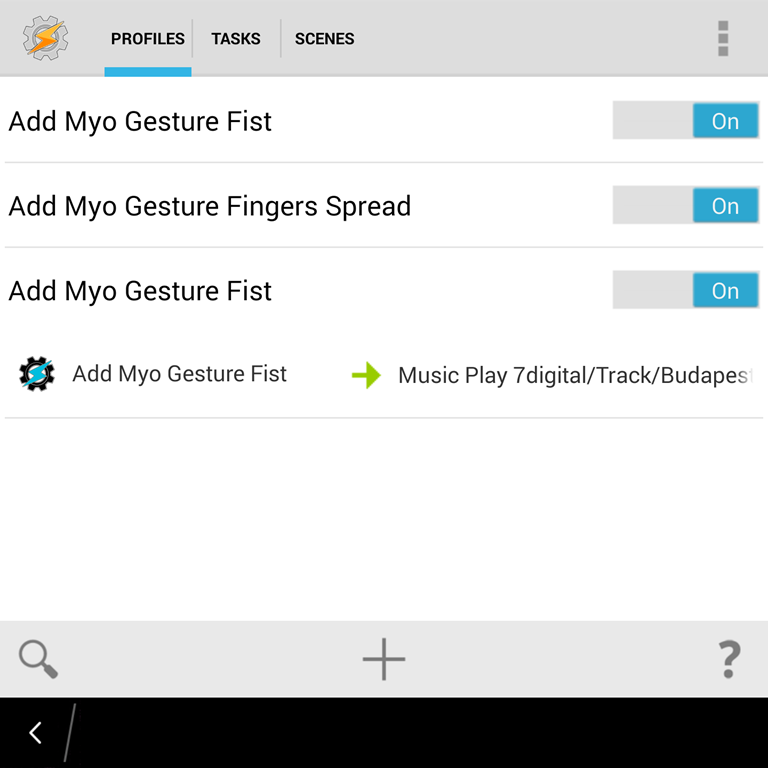 And lo and behold, I found the Android packages for Myo worked right out of the box on my Passport. 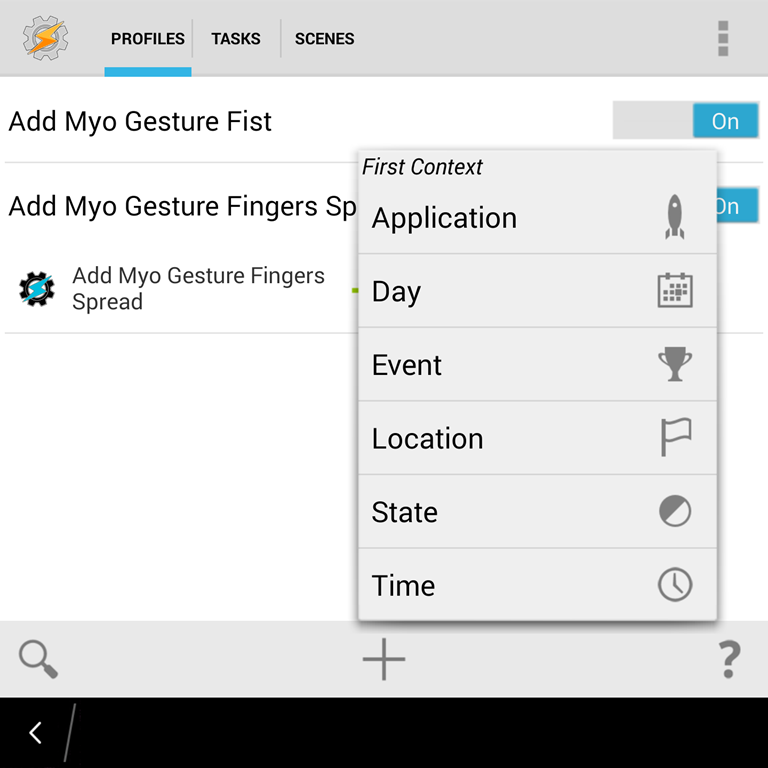 Step 2: Follow the prompts to setup your armband. Note: The pinky to thumb gesture is a bit buggy on the current firmware when working with the Getting Started app (it works fine in other apps). If you are having difficulty, adjust the armband so the blue light faces away from you. Use your right arm. Make sure it is tight, snug and up high on your forearm. Make sure you are standing up. And if it still won’t work, put a bit of hand lotion on your arm – remember this thing is checking electrical currents in your muscles. 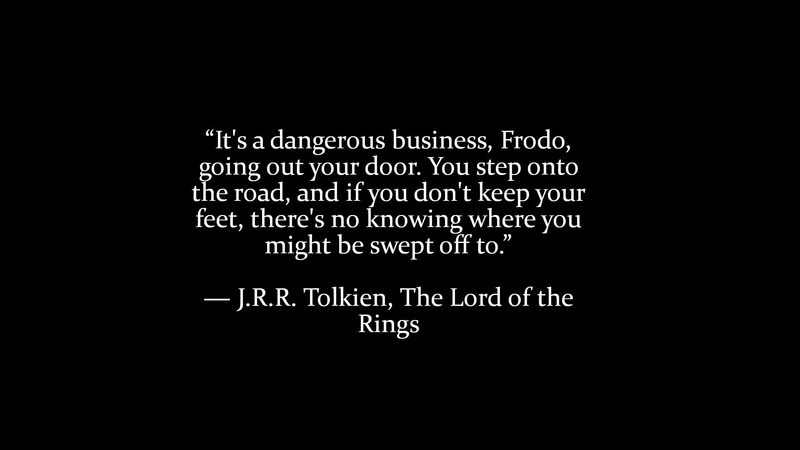 So make its job easy! 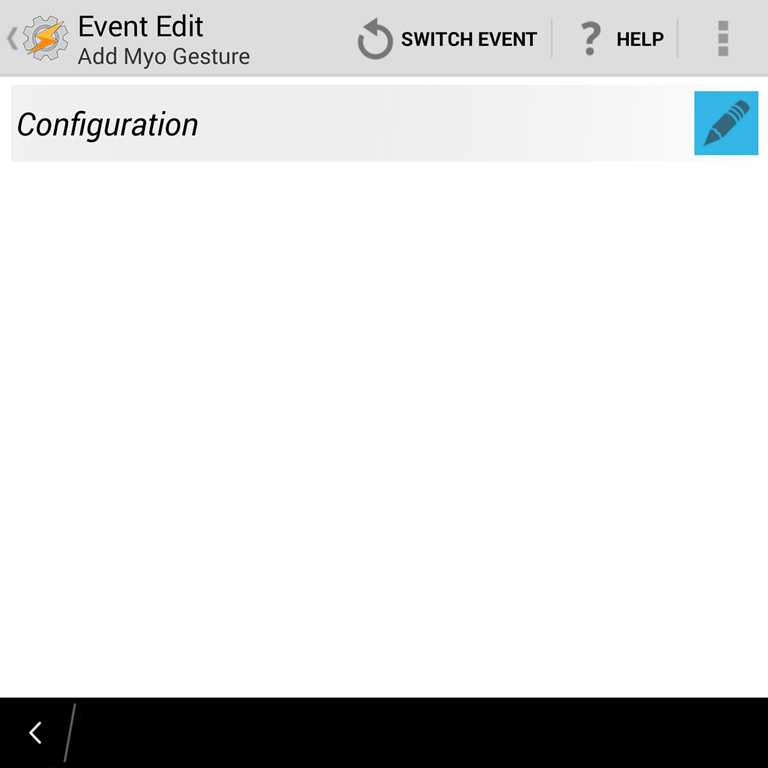 Step 3: Once you have configured the Myo on your PC – you are ready to connect it to your phone. 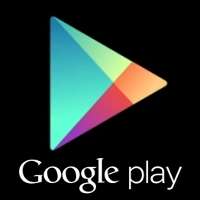 Step 1: Download and install Snap to install apps from Google Play, we will be installing two additional apps. 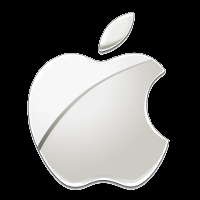 The easiest way is probably to use the chrome plugin or SideSwype if you are comfortable with technology and have a few fun tickets kicking around. 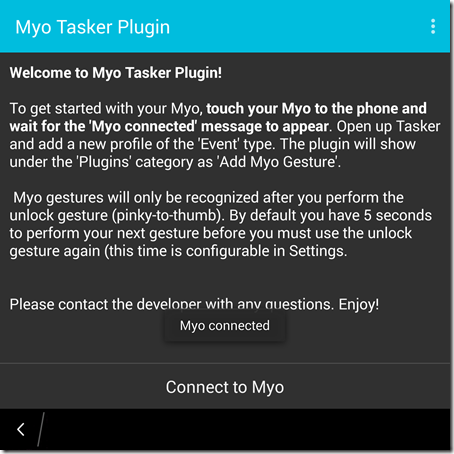 Step 2: Use Snap to install Myo Tasker Plugin. 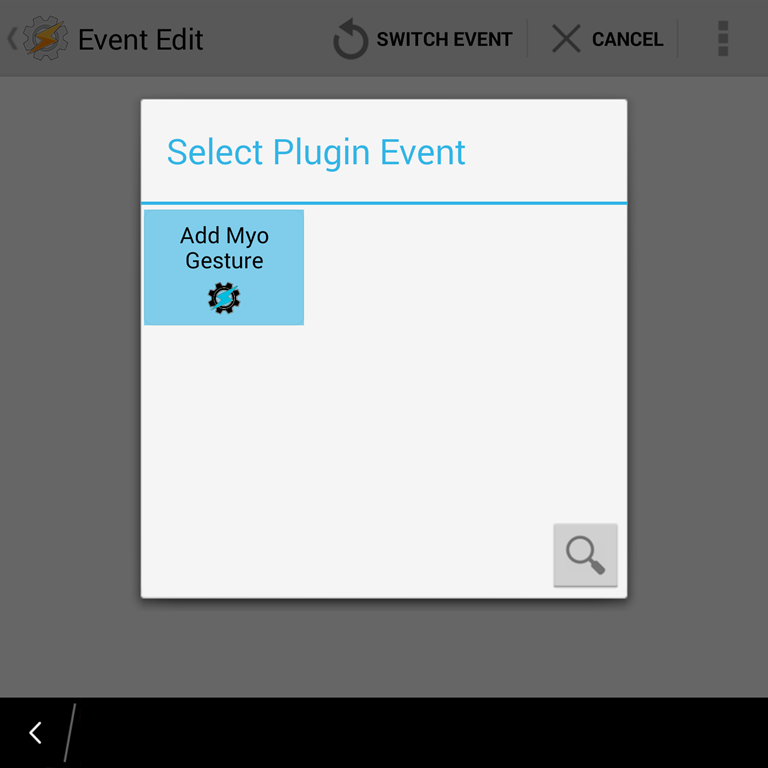 The Plugin will tell you to touch your armband to your phone (edit: I’ve found that putting the Myo bluetooth side to the NFC reader, holding, and pressing Connect to Myo sometimes connects Myo up with the device – there is probably a good process for this but I’m still figuring it out :)). 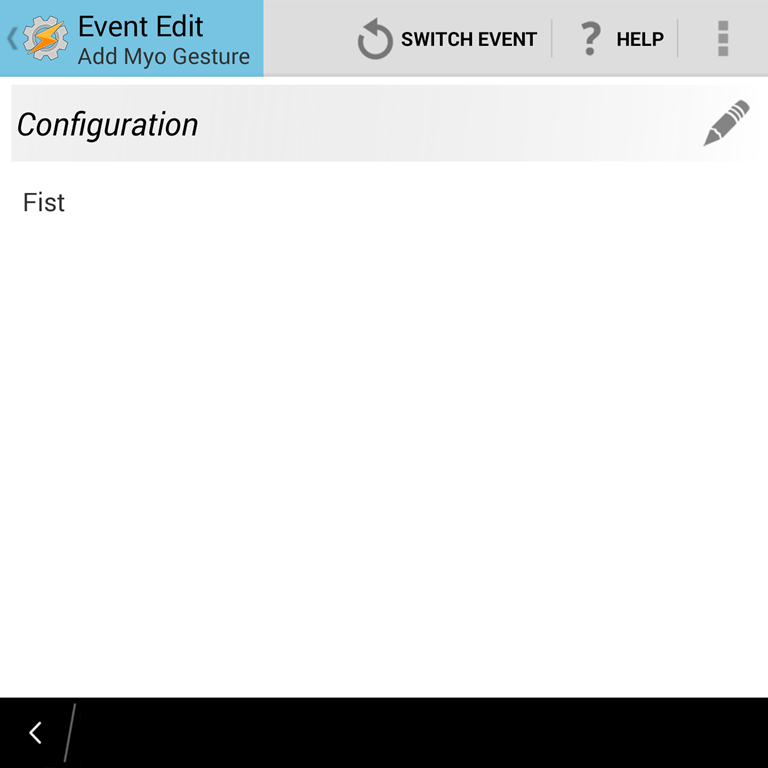 Step 3: In Bluetooth on your phone, connect to your Myo. It should connect and then disconnect right away – thats good and normal. 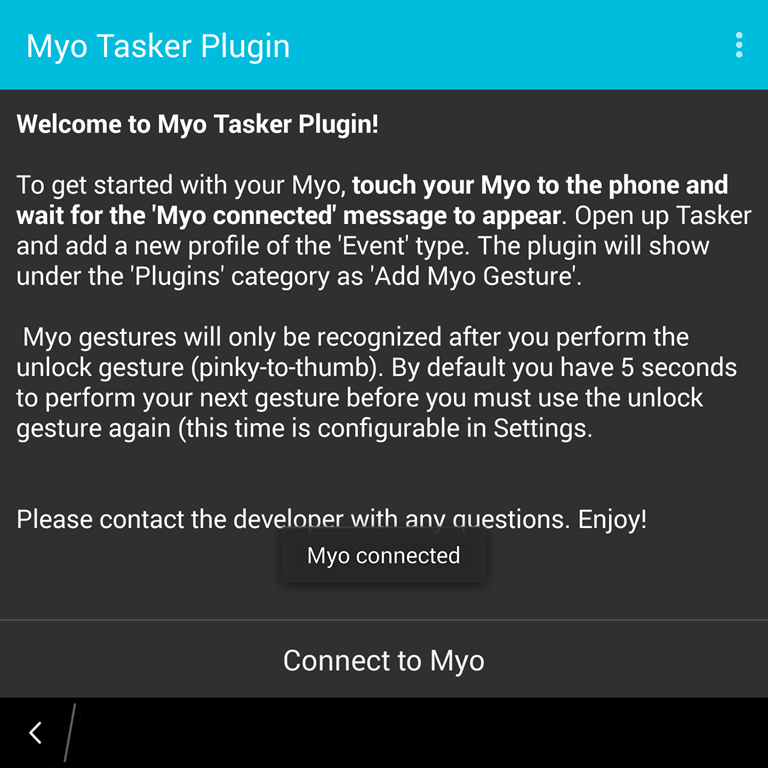 Step 4: Re-open the Myo Tasker Plugin and make sure Connect to Myo button says “Myo Connected”. See photo above! 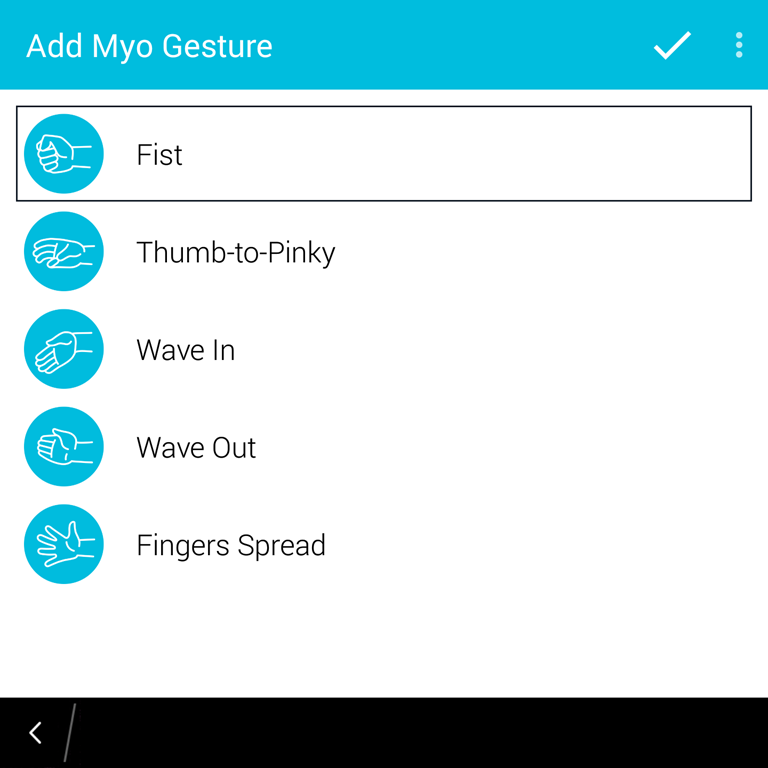 Note: If you press Connect to Myo and nothing happens, use the gesture to Sync (hand tilted backward, and push your arm away from your body). 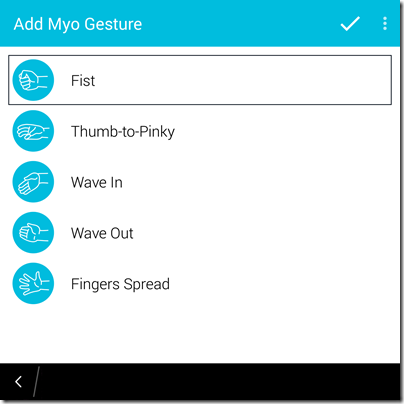 And then use the pinky and thumb to “turn on” the Bluetooth connection to your phone from the Myo. 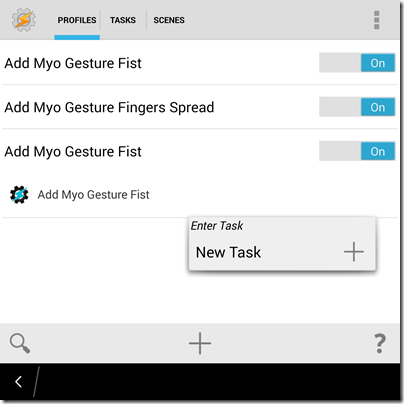 This is necessary for the Myo connected message to appear. 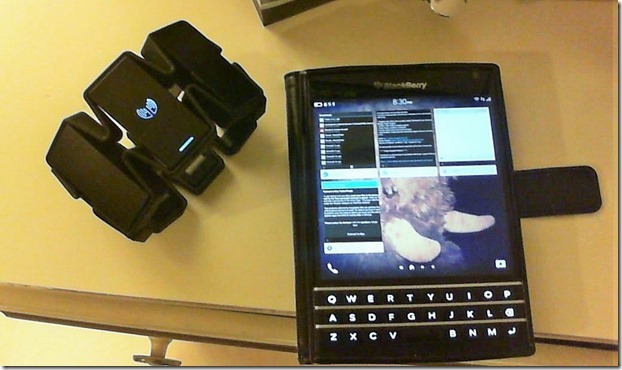 For those of you using Smart Tags to setup NFC and other triggers on your BlackBerry phone, this will be familiar for you. 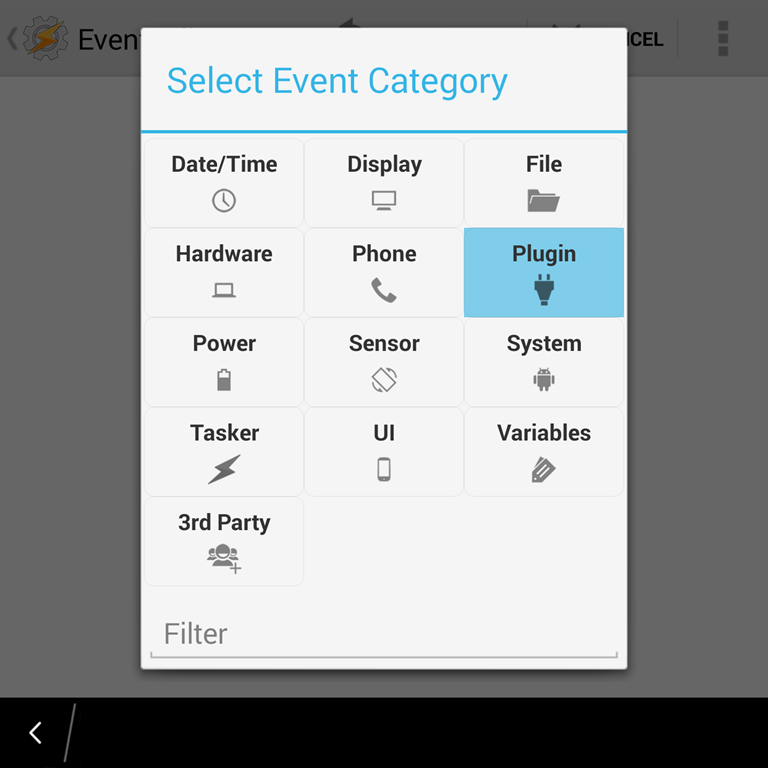 Essentially, we will be using the Android Tasker application to trigger “events” when you use the armband through gestures using the Tasker Plugin. But what about future development? 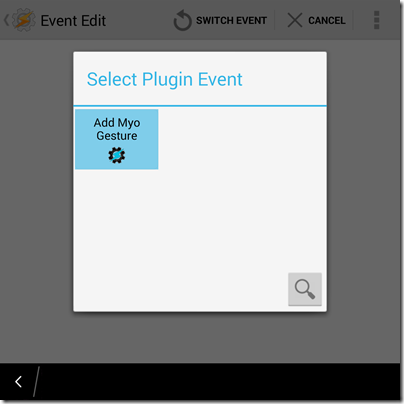 The way I see it, this is only the beginning, now that the Myo connection is working through Android … developers can use the Android SDK OR create their own BlackBerry SDK that uses the Web Service from Myo to send and receive JSON (in developer speak, thats pretty cool stuff). 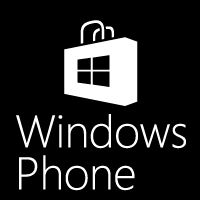 That means its now up to BlackBerry developers to get it to do … well whatever you want! And yes, the armband returns X/Y/Z rotation data AND comes with Unity SDK package with plugin for experimentation. 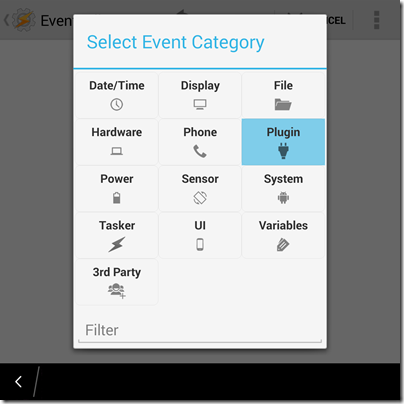 Step 6: Select Event Edit, Back button. We’ve now setup the gesture, we need to tell it what to do with that gesture. Step 8: In my case I picked Media. 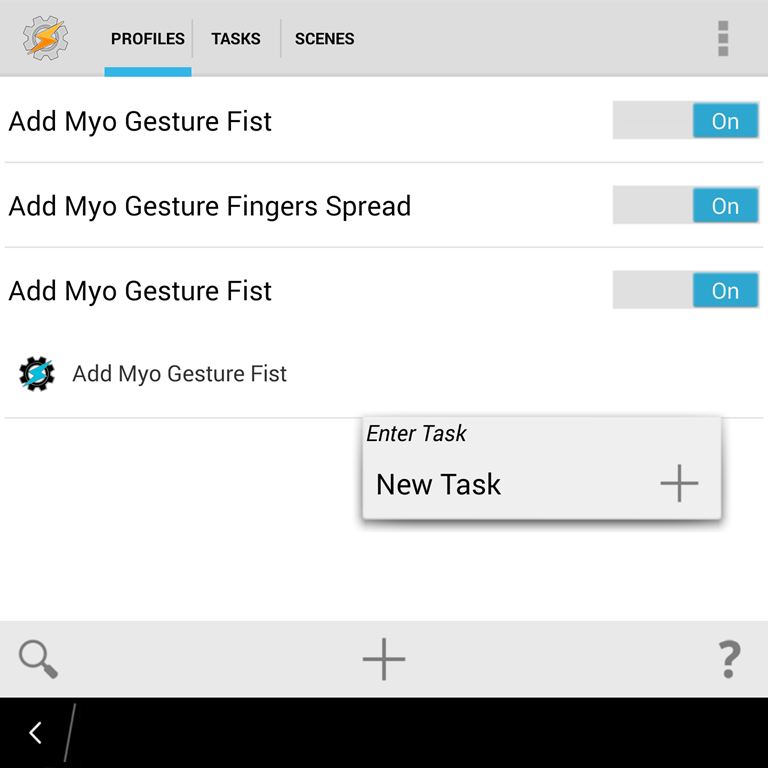 Please note: I suspect not all of these may work on BlackBerry 10. 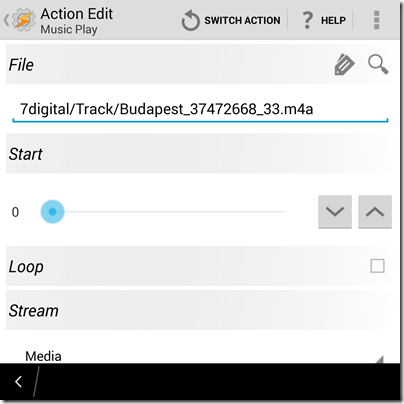 Step 9: Follow the prompts to pick a song, pause audio, change volume, etc! 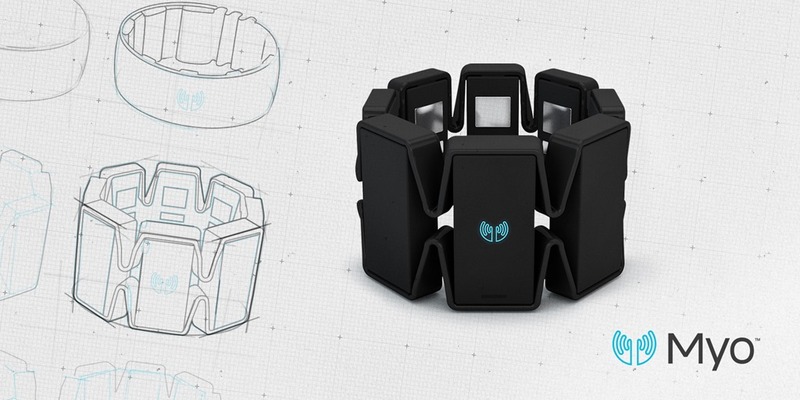 The question now, is what do you want to do with your Myo? It boasts a 24 hour battery life, and looks like it would be perfect for controlling presentations, audio and other fun things when your busy (such as running or exercise). Pretty snazzy toy. If you have any questions on what it can do, hit me up in the comments and I’ll give it a go! 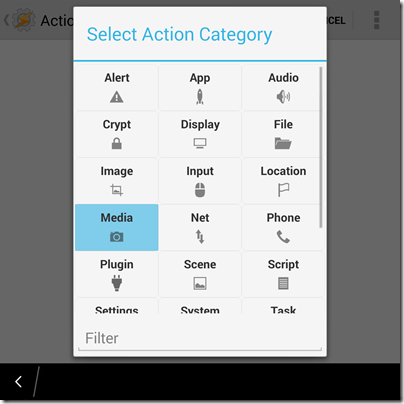 But we definitely have what we need to start looking at BlackBerry apps with the SDK. My verdict: Happy with this fun toy. 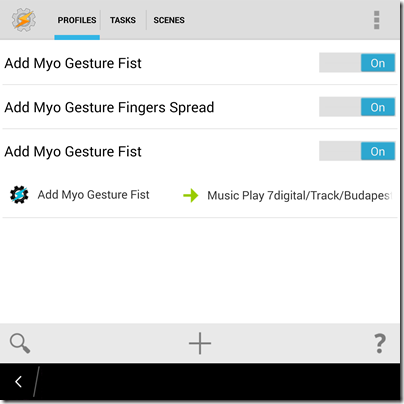 Nice article :bro) Just got my MYO Armband, trying to use it maximum with my BB Z30. I was wondering if you had any chance to create native “connector” on cascades/unity ? Indeed android runtime is stable enough, but you know to have something native is “another feeling” 🙂 how about we donate you $$$ for something native (alternative to Tasker on Android), would that motivate you:)))?